There are hundreds and thousands of amazing WordPress themes offered on the market that picking one is a tricky choice for the discerning site owner. So, if you are you trying to find a brand-new theme for creating a marvelous website or even attempting to refresh your present layout, then look no further..
As, we have done the hard work for you with these particular round-up of the very best, trending, business, responsive, and multipurpose WordPress themes. 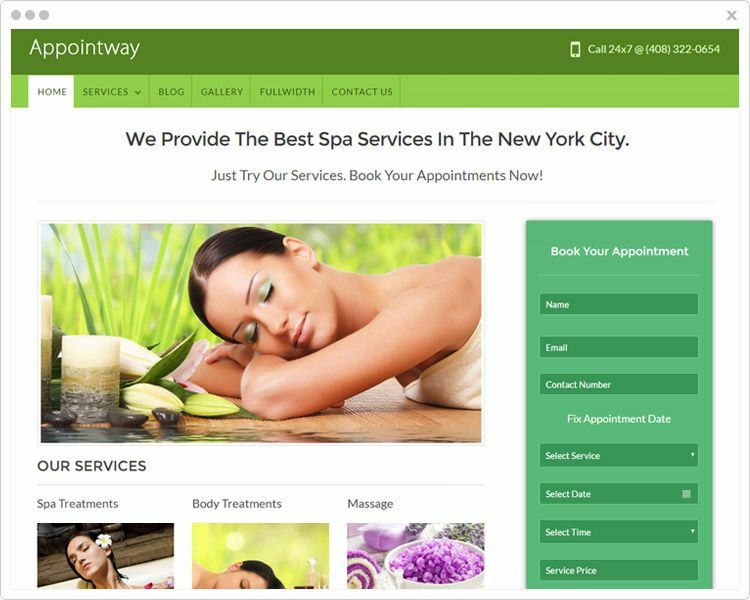 AppointWay is a clean and simple WordPress Appointment Booking theme that can be utilized by persons whose firm demands to give appointment to their customers. Business owners from various fields will really like to make use of this theme to their organization as one can easily fix the site time and day slots for the customers booking. The theme includes an incorporated Ink Appointment plugin which captures leads as well as prevents double booking. Also, it has a functionality of sending a message to the admin as soon as an appointment is reserved from the website. Absolutely, Appointway turns out to be considered a complete solution for nearly any small business. If you are in the sphere of medical & trying to find a responsive WP theme that perfectly matches your quality of life profession then Doctor WordPress Themes are the perfect match for you. Integrated with PayPal payment module. Timing and Address option on the sidebar. Appointment booking form on a home sidebar for multiple bookings. Lead capture form captcha on/off option added. Assembling a successful & profession online marketplace from-scratch can really be expensive. 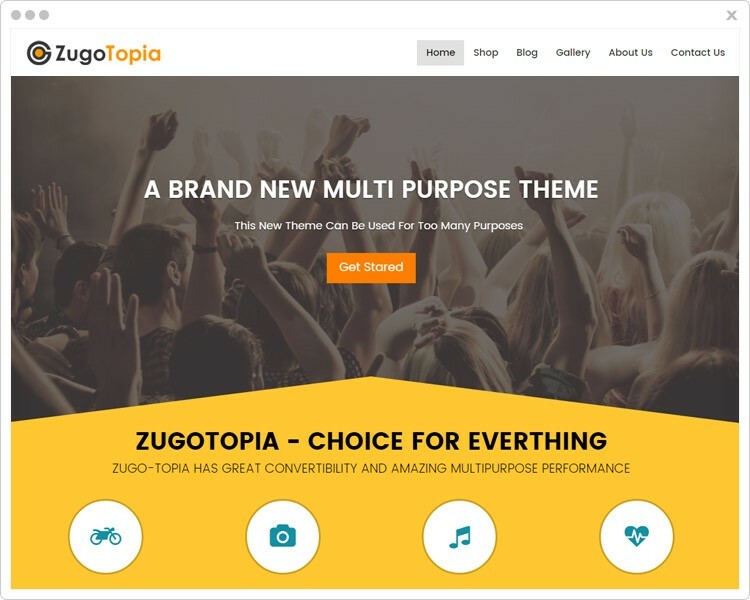 ZugoTopia is a fully-customizable & animated Multipurpose WordPress Theme, packed with features that allow you to devise a superb marketplace for multiple businesses within no time. A unique & crucial characteristic of this template is its multi-vendor performance, by which multiple small business vendors are able to submit services and products on particular site and start attempting to sell their items online. The theme provides an edge to your e-commerce store, which builds a multi-seller website like Amazon, eBay, Alibaba, etc. This will let them earn a decent commission on every sale. Product or site approval option is present from where you can manage the approval of all the vendor products from the dashboard. Vendor Application’ & ‘Track Vendor’ option is available in the template. Change the color of the individual section on the homepage as per your requirement. 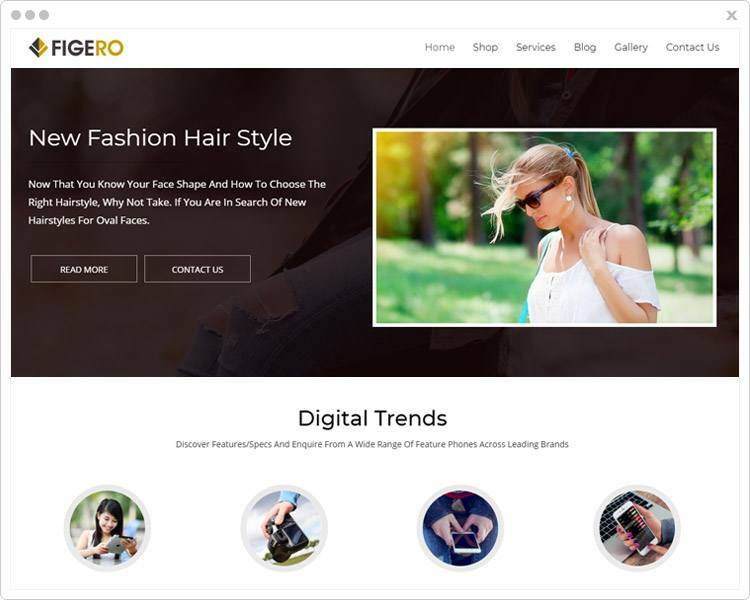 Figero is an easy to use and simple to maintain e-commerce WordPress Template. It’s a handmade tailored theme with dual parallax effect where texts & images seemed on left & right. This is built to embrace an extensive range of contents like images, video, gif and a lot more which deliver the advice more loudly to the prospects and impact them also. This Responsive WordPress Theme is incorporated with a completely free WooCommerce plugin which allows you to sell your products online. It gives the unparalleled functions of payment gateways which is user-friendly and provides easy charging module of PayPal. Breadcrumbs Parallax which displays the images on the top portion of every page. Flaunt the best images of the business in the attention-grabbing slider section. 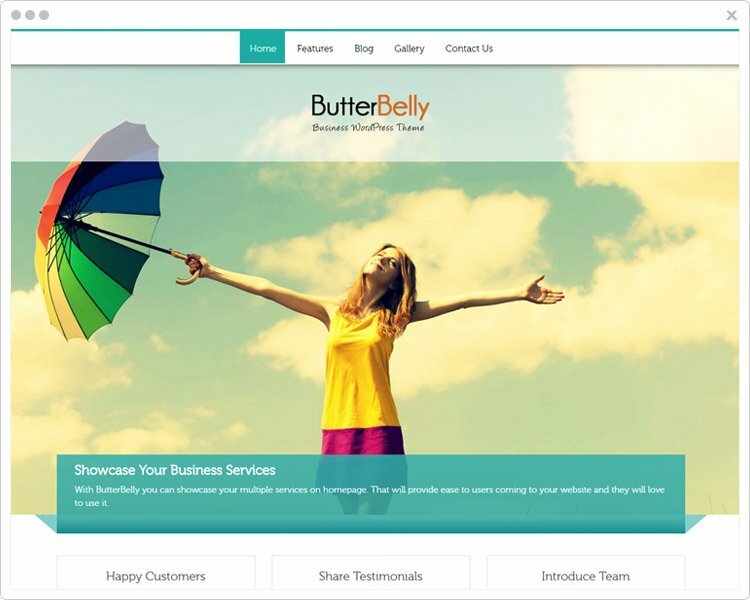 ButterBelly is a fresh, elegant and fully responsive Business WordPress Theme, designed especially for corporate and company websites. Using this WP template you can showcase business services and products within a fullwidth slider of this homepage. It has a 3-column feature section to showcase services, work & offers and an incredible blog section where you are able to launch engaging articles, etc.. This theme has an inbuilt lead-capture form by that you may catch leads and stay linked to your customers by sending engrossing emails. There’s no coding skill needed, and this also makes the total experience working with the theme exceptionally effective and easy. In-built contact form to collect customer’s feedback. Display your company images in the gallery section. Various color styling & social sharing icons. An adaptable theme that fits all screen sizes. Compatible with all type of browsers. Showcase of services and products. It’s really a trendy and tidy lead generating WordPress theme. 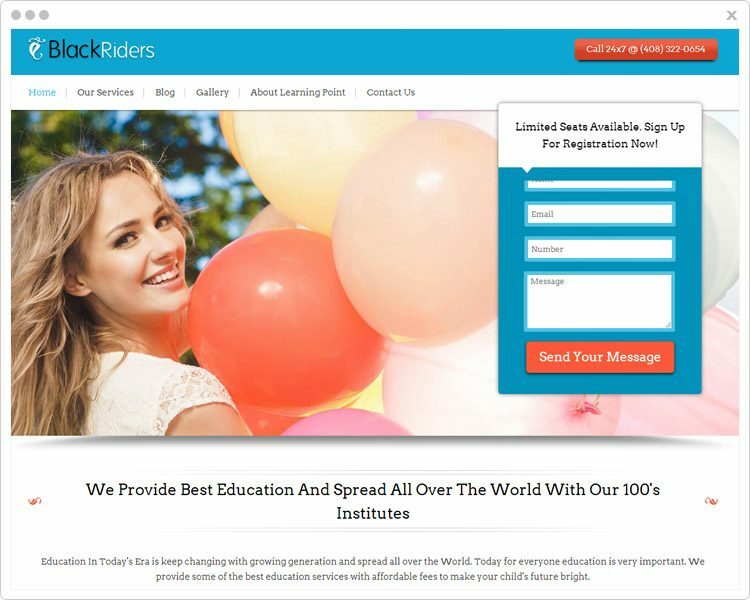 A BlackRider theme is a business template that the magnetic overall look. The theme enables you to construct a stylish small business website very quickly and enable you to showcase your services and products in a more desirable fashion. The theme incorporated into the lead capture WordPress plugin. Simply activate the plugin after installing the theme and start getting outcomes. The plugin dispatches a gorgeous lead capture form on your own site. You may develop an extremely attractive all online business website to showcase your services and products at a better method. A fullwidth slider on the homepage. The theme can be used as blogging and Magazine WordPress theme. Include a professional touch to your blogs and give a superior experience and quality for the readers. 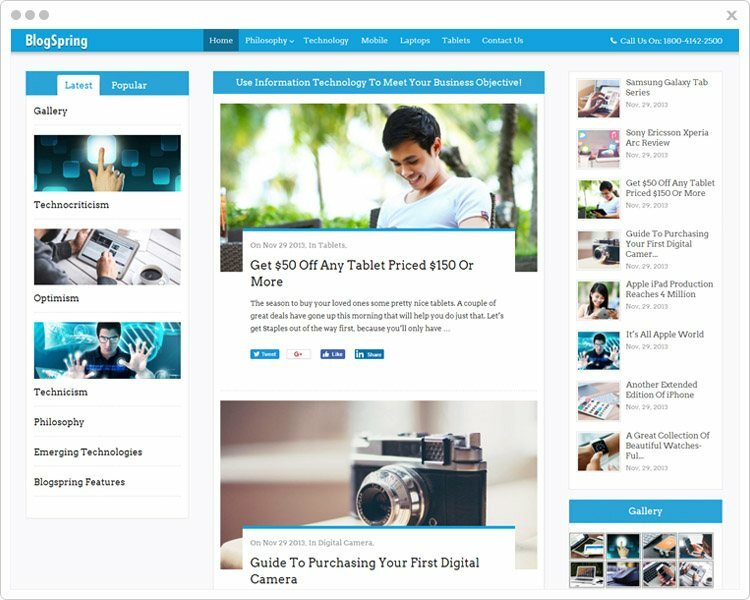 BlogSpring WordPress theme is a whole solution both for creating a news website or a magazine site. It has all features which you will need to create an entirely professional modern-day news blog internet site or an online magazine website. You can now concentrate on framing notions on political issues, societal dilemmas, revolutionary ideas and thoughts and create your articles reach a greater audience. You may even collect news and any information on any specific matter and grow your WordPress website fast. Category Post Widget Added to display the posts category wise. Contact Information Feature added in the top right corner. Under the Blog, Easy Navigation options to the previous blog post or next blog post available. Effective Comment Section associated with each blog post for readers to submit comments. Inbuilt Tap to Call Feature at the right top of the homepage. Now, since you’ve strolled across the many tasteful topics out in the marketplace, it would be quite possible for you to setup your WordPress site. Select the one that suits your business needs and measure towards a fashion & glamourous world.